Georgia Tech Campus Center – At 300,000 sq. ft., Georgia Tech’s three building project will expand the campus from its symbolic core, Tech Green, and radiate it west. Stemming from the original Student Center building, the Campus Center project will update the 1970’s building, originally meant for 7,000, to a campus hub which will accommodate over 23,000 students and 7,000 faculty and staff. 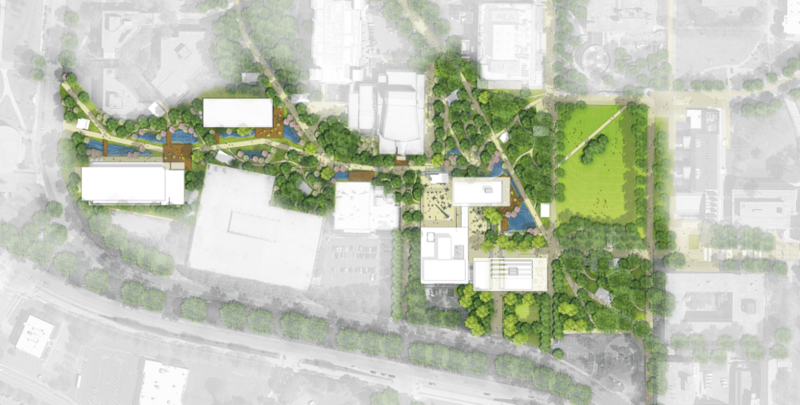 The Campus Center Project will comprise of 3 buildings, the original Wenn Student Center which will be renovated, a new Exhibition Hall, and a pavilion with a small café along with a network of new outdoor pathways and plazas. 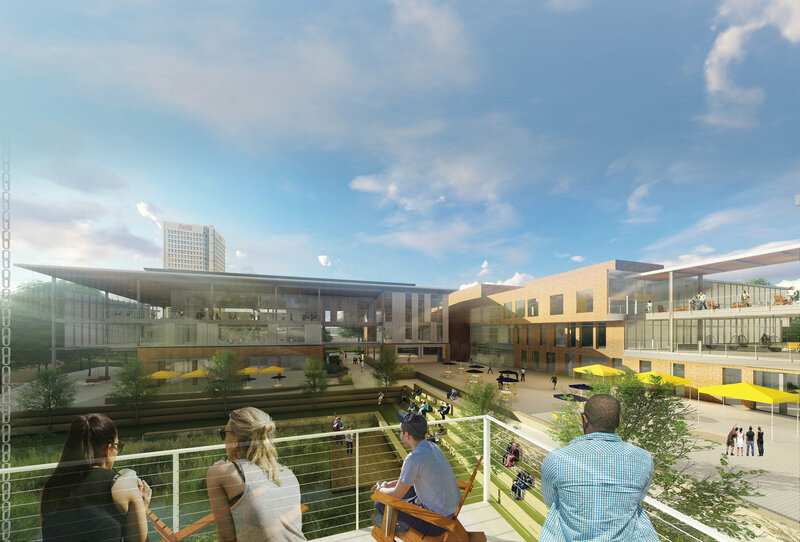 The Campus Center at Georgia Tech allows the university to redefine campus centers in terms of sustainability and performance. The integrated team with Workshop, Cooper Carry, Newcomb and Boyd, Gilbane and Pattern r+d pushed the envelope in terms of setting stringent goals. Climate Data – A basic understanding of the existing climate conditions is vital for making performance design decisions. Optimizing the massing design during early-stage modeling makes sure the building is energy efficient without additional cost impacts. Using a range of climate analysis diagrams to shortlist strategies in terms of building shape, orientation, or glazing percentage collectively correlates to the building’s final energy and cost performance. The following points are climate studies done for the project site which is located in midtown Atlanta, Georgia. Yearly Temperature – The yearly range of temperatures for dry and wet-bulb conditions indicate that Atlanta is a hot humid climate that has a surprising amount of days that require heating. Counter-intuitively, there are often slightly more heating than cooling days. Solar Radiation – The yearly solar radiation for Atlanta shows that the summer months have less direct solar (in red) and more diffuse solar radiation (in yellow). This is the result of more clouds during the summer rainy season. Humidity vs Temperature – Atlanta exhibits wide swings in the humidity level from day to night during the summer making natural ventilation unlikely. Red is humidity and green is temperature. 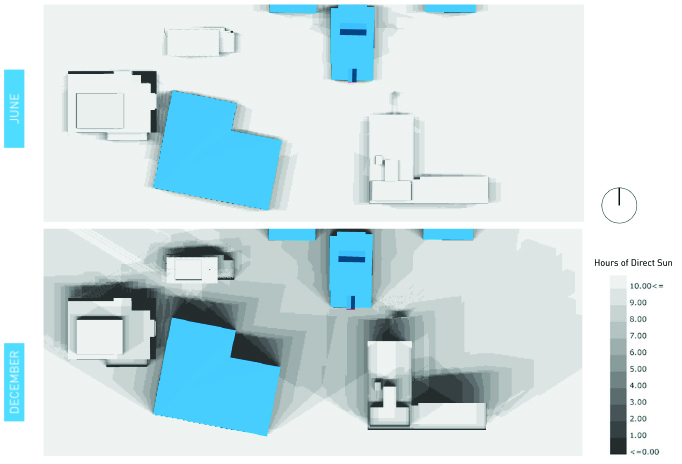 Wind – The diagrams show the wind direction and intensity coming to the campus. The dominant wind direction is South West for spring, summer and fall, when the use of wind might be a helpful strategy. Psychometric Chart – This chart shows the relationship between dry-bulb, humidity ratio, and enthalpy. The polygons overlaid on the chart represent different strategies to increase comfort. According to this chart, the only strategies for improving comfort in Atlanta involve allowing internal heat gain (beneficial in the winter) and desiccant dehumidification (beneficial in the summer). Thermal mass, use of fans, and evaporative cooling have no effect on comfort. Adaptive Comfort Chart – Here we see the total hours of the year plotted Indoor vs Outdoor temperature with a polygon representing comfort. This graph is effective for understanding the possibilities for natural ventilation. It is clear that the vast majority of the hours of the year are falling outside the comfort band. Thus mechanical strategies are best for achieving comfort. Radiation Maps – This diagram below shows the total solar radiation falling on each of the buildings. It helps us understand which façades have lower direct solar gain and which facades have higher solar gain. 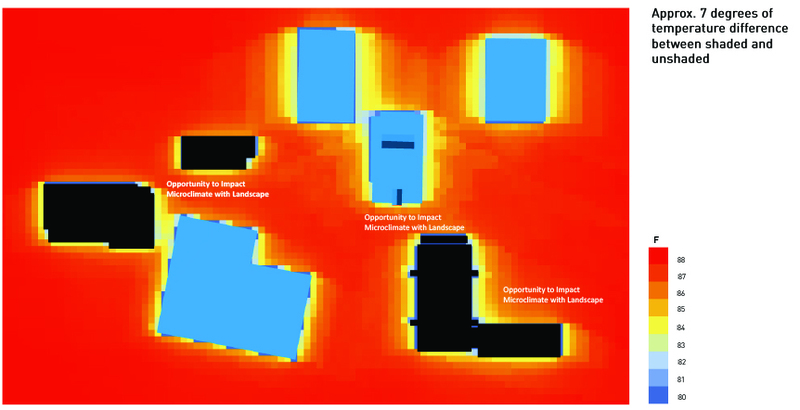 Knowing the radiation map of a massing model in the early design phases can help determine façade strategies like glazing percentage and window locations. A basic understanding of target values is key to comparing performance design decisions. EUI – Expressed as energy per square foot per year, knowing the EUI values of design decisions and other iterations, one can get the best value for performance. Below the design team used cove.tool to find their buildings benchmarks in order to inform and guide the team towards setting their own energy targets. The USA national median for EUI was 99 kBtu/sqft/yr. 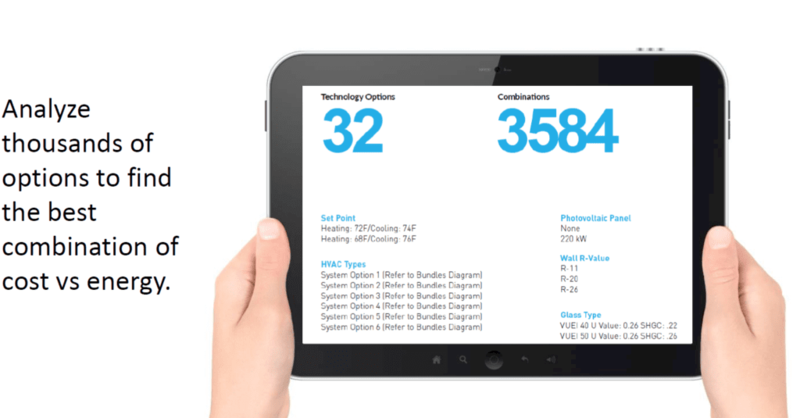 Reviewing the bundles – cove.tool uses advanced algorithms to optimize for first cost and assists in making rigorous metric based decisions on cost and energy. The different technologies and their options are listed to the left. Using cove.tool’s optimization tool to compare EUI performance and cost correlation, the project team used their known technology inputs into cove.tool’s parallel coordinate graph showcasing over 4,000 bundles to find the optimal in terms of first cost and energy.